Some 150 million 3D glasses will be given away for Super Bowl viewers to watch a 90-second 3D sneak preview of the big-screen animated feature "Monsters vs. Aliens." LOS ANGELES — Talk about a monster of a promotion. Some 150 million 3D glasses will be given away for Super Bowl viewers to watch a 90-second 3D sneak preview of the big-screen animated feature "Monsters vs. Aliens." While 3D telecasts are nothing new, this marks the first time one has been done for such a large audience. DreamWorks Animation chief executive Jeffrey Katzenberg called the stunt "perhaps the biggest media-advertising event in history." He wouldn't give a hard figure on the cost, but said it "involves tens of millions of dollars." Katzenberg promised the quality of the 3D will be superior to what has been done in the past. He said the glasses will use Intel InTru 3D and ColorCode 3-D, which updates the old red-blue Anaglyph system. The technology will also allow those without the glasses to see an almost ordinary image on the TV screen. But, Katzenberg added, it still doesn't come close to the 3D quality moviegoers will see in theaters when the film opens stateside March 27. "Monsters vs. Aliens" follows a group of ragtag Earthling monsters who are out to save the world following an alien invasion. The film features the voices of Reese Witherspoon, Seth Rogen and Kiefer Sutherland. The glasses will be distributed free at Pepsi/SoBe Life Water displays at 28,000 locations including grocery, drug and electronics stores and big-box retailers. The promotion was unveiled Saturday during NBC's telecast of the AFC Wild Card Playoffs between the Indianapolis Colts and San Diego Chargers. NBC, which will air the Super Bowl on Feb. 1, has its own interest in making sure the glasses are used, as it will air a 3D episode of its series "Chuck" the following night. 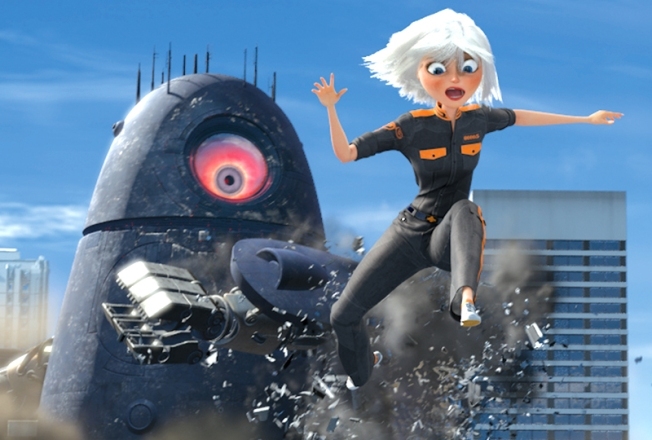 "Monsters vs Aliens" is co-directed by Rob Letterman ("Shark Tale") and Conrad Vernon ("Shrek 2"), who supervised production of the promotion that will air during the Super Bowl. The directors said they will be watching the telecast from home. "With beer," Vernon said, laughing. "We're going to test the effects of beer and 3D," said Letterman.